The Commercial Quarters is the economic heart of the capital for housing most of the Empire's trade. But beyond the companies, it is the place where all the social and religious groups, foundations and other mercantile activities are too. 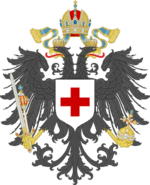 The Imperial and Royal Red Cross of Karnia-Ruthenia, also known as IRCVKR, is the national Red Cross Society in Karnia-Ruthenia. It is the first humanitarian organization in the Empire and is headed by Her Imperial and Royal Majesty, Empress Paloma of Karnia since its foundation on 11 November 2018. Founded by Oscar I, its objectives are raise funds for the International Red Cross and other humanitarian causes, make contributions to organizations of humanitarian aid, and promote philanthropic campaigns and health awareness. On 19 November 2018, to celebrate the Empire Day, the Imperial and Royal Red Cross of Karnia-Ruthenia held its first action. A blood donation campaign was held and His Imperial and Royal Majesty, the Emperor-King and Her Grace, Baroness Caroline Eisenland, made a donation to the Hospital of the Public Server of São Paulo. The donation amounted to 920 milliliters of blood. On 26 January 2019, Their Imperial and Royal Majesties, the Emperor-King and the Empress raised water donations for the victims of the Brumadinho dam disaster, on behalf of the Imperial and Royal Red Cross of Karnia-Ruthenia.